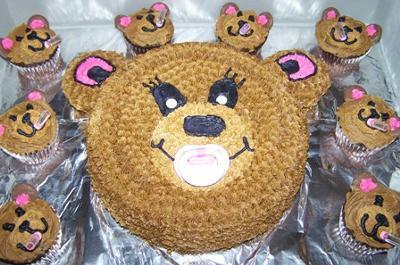 Boy do we have some cute teddy bear cakes to show you! 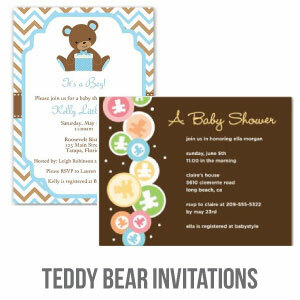 They are perfect for a teddy bear-themed baby shower! 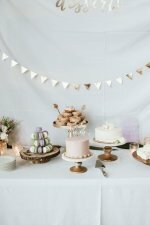 Get inspired by all of the cute cakes and cupcakes! 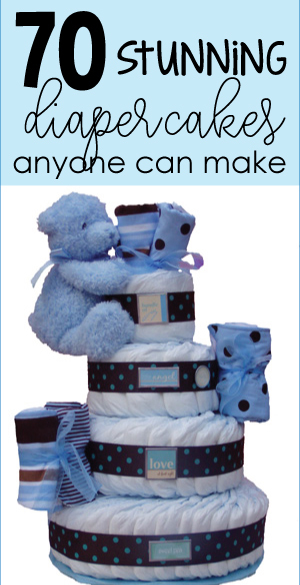 Looking for teddy bear diaper cakes? We've got those too! Get your scrolling finger ready, because you are about to experience some extreme teddy bear cuteness! 2nd PLACE WINNER IN OUR CAKE CONTEST! I baked two 9 in square cakes. Filled and stacked them and covered them in a light yellow butter cream frosting. Then, I added the light blue vertical stripes with rolled fondant. To make the lid I covered a 1 in. thick piece of Styrofoam, which was also 9 in. square, with the light blue fondant and then added the yellow polka dots and ribbons. I molded the little teddy bears using assorted sized ball and oval shapes of fondant and added the detailing with a toothpick. The bow is also made from fondant. I rolled the yellow fondant to about 1/8 of an inch thick and then cut about 20-25 1X6 inch strips. Rub a little water on one end of the strip and fold in half set it on edge on the counter and shape a single loop. Roll out the blue fondant to about 1/16th in. thick and cut 4 strips about 1/8 in. wide and about 10 in. 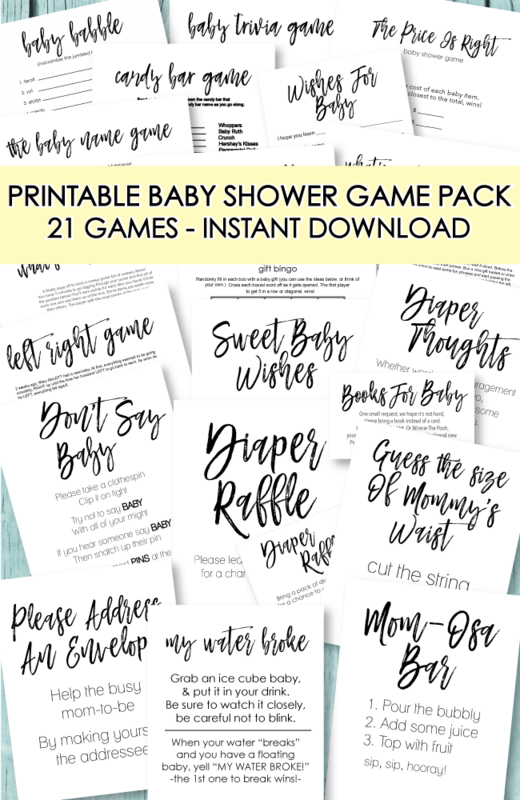 long, wrap these around a drinking straw. In and about 6 hrs., when the the loops are firm enough to hold their shape while standing upright you are ready to assemble the bow. I made the bow in a 6 in round cake pan just to help me keep it nice and round but you can make it on the counter if you do not have a pan this size. I cut a piece of wax paper about 4 in. square and put in the bottom of the pan then I drop on a little mound of melted white chocolate in the center. Place a circle of about 10 bow loops then another mound of chocolate and then the next layer of about 6 loops and then a final mound of chocolate and the last 2 or three loops, whatever you can fit in. 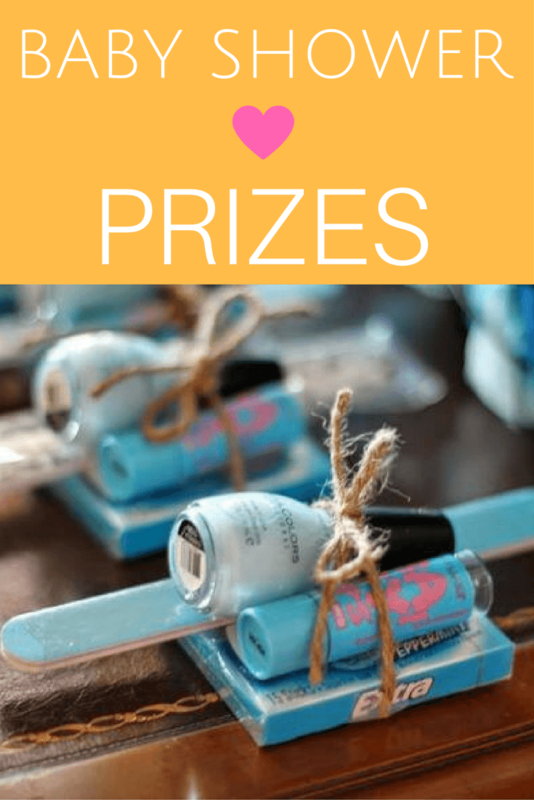 Gently slide the blue streamers off of the drinking straws and cut into 2 1/2 in. long pieces. 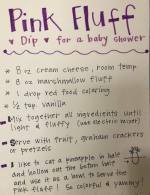 Dip the end in the chocolate and stick in any gaps in the bow. Let sit until the chocolate is nice and firm. Place two 5in dowel rods, one in each corner of one side of the cake. Roll out blue fondant as thin as you can get it and cut into about 3in. 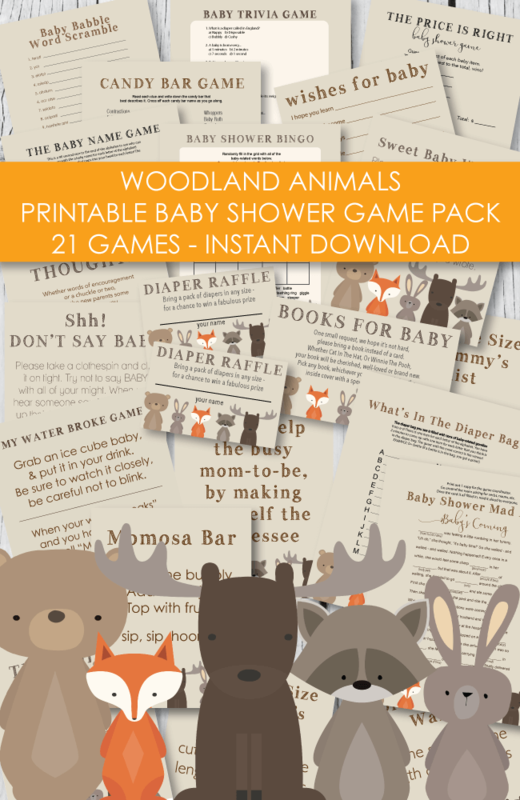 squares and arrange to look like tissue paper using paper toweling to support it if necessary. (Just remember to take it out after the fondant is dried). Place the lid on top; it should sit at an angle because of the dowel rods. Using melted chocolate; attach the bow in the middle if the lid and the bear in front of the bow. Roll assorted size balls of white fondant to the bottom to act as border. This is a large bear cake - it fed 60 people! I used a bowl to bake the circle for the head of the bear, and a rectangular sheet pan to bake the body of the bear. The scraps I trimmed off of the rectangle became the arms and legs. Then I used a serrated knife to round all the shapes out so it would look soft and cuddly like a real teddy bear. From there I piped chocolate butter cream using a star tip to give it the "furry" look. 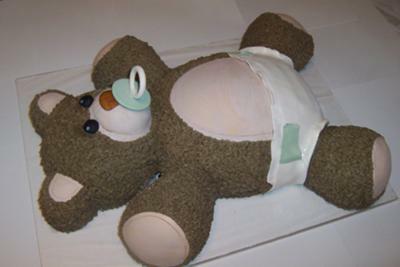 The diaper, pacifier, nose and belly of the bear were made of rolled fondant. The final detail was rolling a quilting tool along the edges so it actually looked like it was sewn together. It turned out really cute! Use a 10 inch pan and an 8 inch pan. Basic butter cream frosting, then made homemade fondant. Rolled it over the cake. Took cookie cutters and made the shapes I wanted. I used three different colors of fondant. Added the teddy as a final touch. 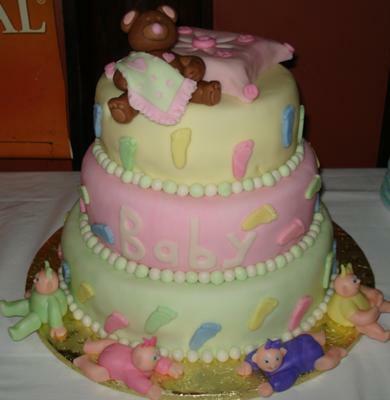 I made this three tier pink, yellow and green teddy bear baby shower cake with each tier a being a different flavor. All figures and accents were made using fondant. I made a two tier teddy bear cake with all edible decoration made out of gum paste. The bear and the bow are hand made of gum paste. You make the bow prior and let it dry - apply it to the cake with stiff royal icing. 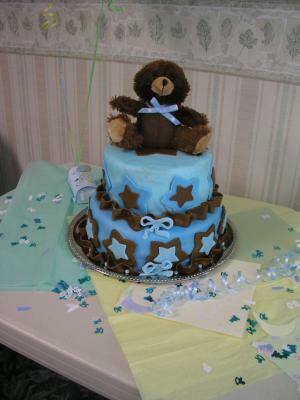 I made this sweet teddy bear cake for a friend who was having a boy, and had brown, blue and bears for her theme. I baked one 13 inch round and a 5 inch round vanilla cake. The filling was chocolate mousse. The were both covered in homemade mm light blue fondant. Then I made 2 white fondant strips for the base of the cakes. For decoration, I made small brown buttons out of fondant and placed them on the strips. Rattle was made by using a candy apple stick as a base. It's handle and globes were made from gum paste and the decorations from fondant. Booties were the hardest part! They are made from gum paste. Pieces cut separately and formed together. I actually laced them with strips of gum paste and made a bow on top. Banner was also gum paste and written with edible ink marker. For this teddy bear cake: I stacked two 9-in round cakes together layered with butter cream. I used a star tip to cover the entire cake with brown colored butter cream. I secured a cupcake with toothpicks on both sides for ears; I then took the star tip and covered them with the brown butter cream. I took a lighter brown butter cream and free handed a muzzle with a star tip. I took a writing tip and drew on the eyes/eyelashes, nose, and mouth in black colored butter cream. I took pink colored butter cream and filled in the ears with a star tip, I then took the black butter cream and did an outline of the ears. I used two white chocolate chips for the eyes and stuck a pink pacifier in the bear’s mouth. For the cupcakes: I iced the cupcakes in brown butter cream, I then took a lighter brown butter cream and free handed a muzzle. Next I placed a milk chocolate melting round on each side for the ears; I took pink icing with a star tip and made the inside of the ears. Finally I took black butter cream with the writing tip and made the eyes, nose, and mouth. I finished it off by placing a tiny baby bottle in each ones mouth. This is a great cake for 1st birthday's as well! 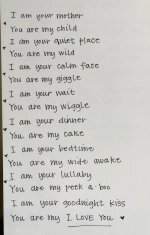 I am making two for my twins using blue for the boys ears and pink in the girls with the longer eyelashes and perhaps a hair bow!! 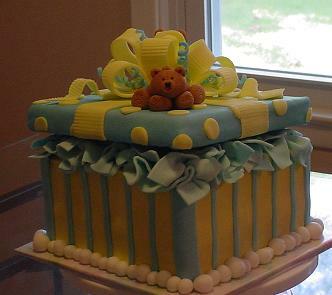 I have totally fallen in love with this cake I would love to have this cake at my upcoming baby shower!!!! I made this brown and blue polka dot teddy bear cake using an 8" round cake and covered it with home made chocolate fondant. 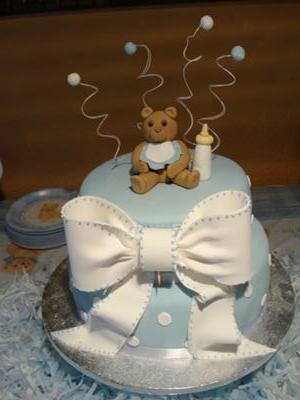 The bow and teddy bear are also made with fondant. Just beautiful - hopefully I will be able to create something on this level soon. Just started decorating cakes. You did a wonderful job. I would buy this cake without a doubt. 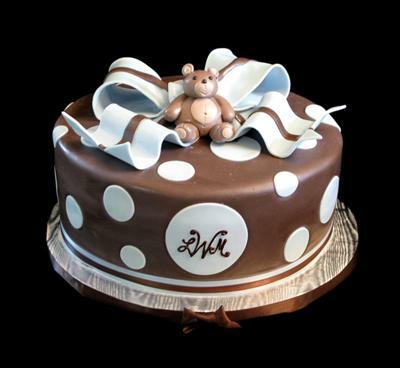 This sweet teddy bear cake is so adorable! Great job! 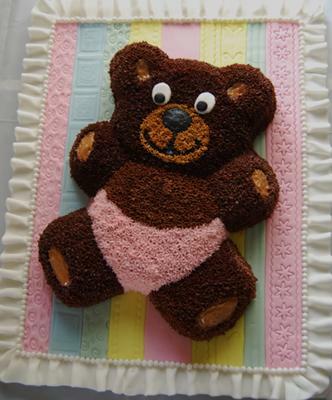 This teddy bear cake looks simple but I'm sure it was anything but! It is so much different than what I would think I would look for but after seeing it. 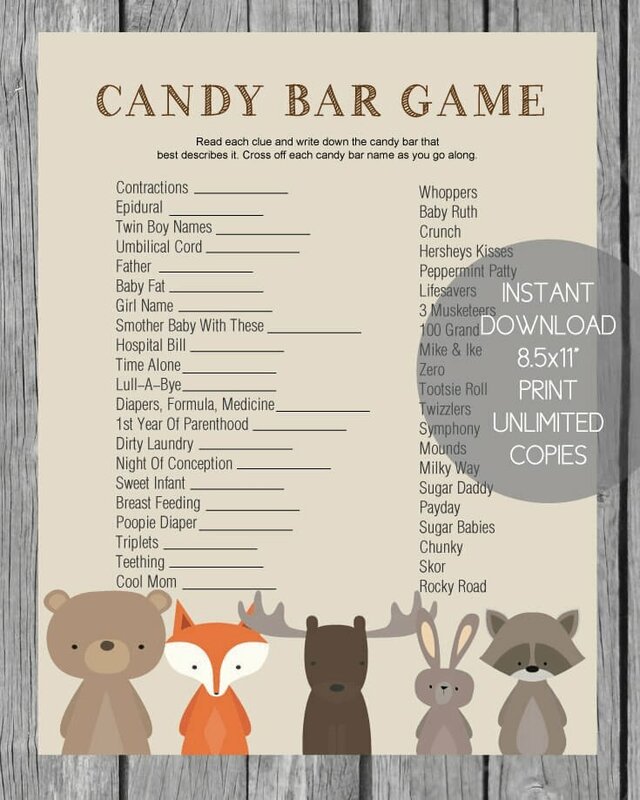 I WOULD BUY ONE IN A SECOND!!! This cake is beautiful. Great job! 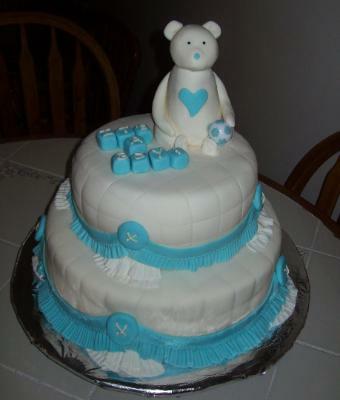 I made a simple chocolate and vanilla layered teddy bear cake with baby blue filling (Butter Cream). All the decorations are made using marshmallow fondant. Sta super lindo amiga.....me gusta y c me antoja tambien - felicidades! Very beautiful cake. I like the style, Its very professional. Its so cute. Beautiful, I like the ribbon around the cake. Looks delicious. This cake is very nice - I love the bear. Now I really want to have another baby so you can make the cake. It is BEAUTIFUL! It looks delicious however I would hate to eat it because is too beautiful to cut down. very nice cake - good job! Very nice design - I Love it. I made the ruffles by hand out of fondant. The fondant strips were made by using little molds to decorate them. The cake was made out of a teddy bear cake pan mold. I decorated the cake with frosting using a piping tip. 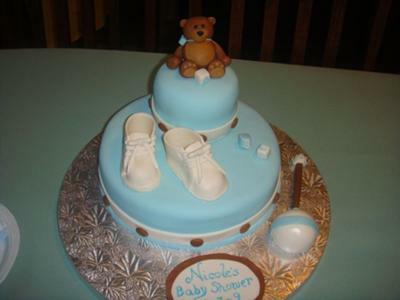 This was actually a pretty easy baby shower cake to make! 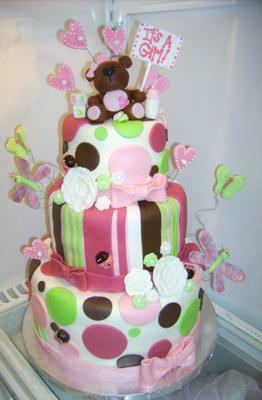 This striped and polka dot teddy bear cake screams baby girl from the pink polka dots to the teddy bear and butterflies. This cake was inspired by a baby blanket the mom to be brought me. We tried to pull in every color and element from her blanket and I think we rocked it! The cake was strawberry swirl with white chocolate frosting. Everything on this cake is made with fondant. I made the hearts, dragon flies and butterflies and stuck the wires in them while they were sill soft. 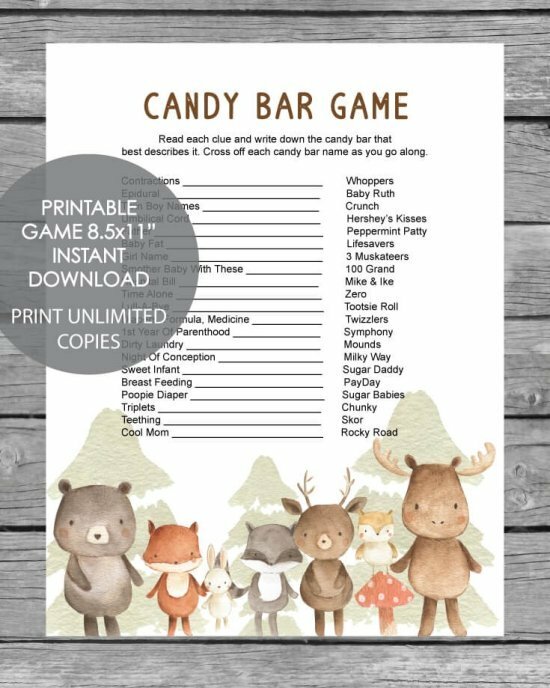 You want to make these as well as the teddy bear, lady bugs, and flowers about a week in advance so they can be firm enough to stick on your cake. This was an easy cake, once I had all of the decorations made a week in advance, I just covered my tiers (the top and bottom in white, the middle in pink) and put on the fondant polka dots and stripes. Where did you find the picks? They offer such a cute way to add the dragonflys and butterflys. Such great attention to detail. this cake is adorable! I love the butterflies that aren't touching the cake but still attached. Very creative Erin! Awesome colors! Awesome details too!! It is so beautiful and cute!! 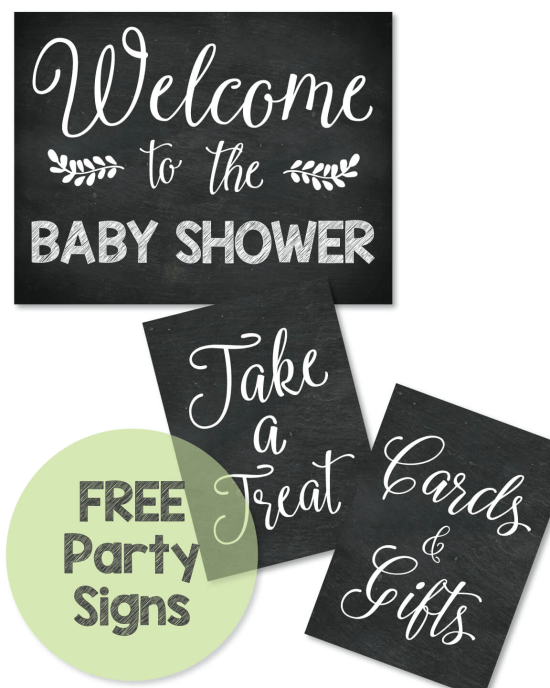 Fun and energetic, It looks like the perfect complement to a baby shower party! Beautiful blend of colors that highlight and celebrate the birth of a baby girl. Truly the work of genius. Very clever. I love that this cake has a lot going on and yet it all works so perfectly. It would definitely be something I'd want to order! It looks incredible! You do great work! 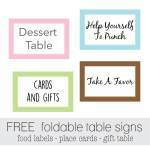 Very talented and I love it that you tried to be attentive to your clients wants. That is very important. She brought you the blanket and you designed your cake from it- I think that is great!! And the lady bugs are my absolute favorite!! Great job! Pooh Bear And Friends cakes! See them here.